Running ads is not rocket science. The hard part is growing a team to manage results as you’re scaling your business without dropping the ball. This is where an agency comes in, and a lot of talented, intelligent people have tried and failed to start and grow their own ads agencies. This won’t help you start your own agency in a day (I do NOT support the mentality that starting an agency is the next best money-maker), but it will give you some insight and motivation to grow your own team the smart way. 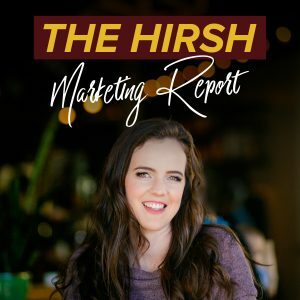 Tune in for a quick, yet detailed inside look at how we work here at Team Hirsh! In today’s episode, I’m going to give you an inside look at how our ads managers on Team Hirsh are trained. So this will be a little bit different of an episode. Rather than straight marketing advice, it’ll be a little bit more behind-the-scenes look. But I get asked this all the time by business owners, so I feel like it’ll (a) show you kind of what we do behind-the-scenes of our company, but (b) maybe even give you some insight and motivation on how you could train your own team. Because, a lot of people ask me, “How have you been able to scale so fast? 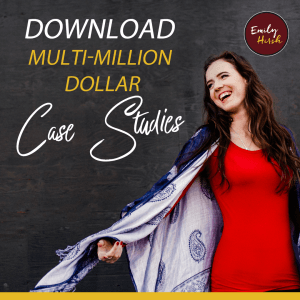 How have you been able to take on so many clients and grow your team so fast?” To give you some perspective, a year and a half ago I had one ads manager, and I now have nine. We have over 60 clients on our roster, so obviously I can’t be in an ad account of 60 clients every day. So I have to train my team and have the best processes that allow it so that nothing slips through the cracks, so that we can continue to hold our high level of standards that we do have for our clients, and continue to grow and scale. And it’s really not easy. Honestly, with growing an agency, there are some very talented marketing and Facebook ad people out there who can’t grow an agency because they don’t want to do the team part. And I always say like, when I talk to clients, prospective clients, “Running ads is not rocket science.” If it’s your jam, and if marketing is your jam, you can learn it, and you can do it, and you just have to stay on top of it and be smart about it. What is hard is growing the team big enough to manage the ad spend that we manage, the level of clients that we manage, and the volume of clients that we manage, without balls dropping. And I also 150% know that a lot of people who have come to me with bad experiences from previous ads managers or ad agencies is because those people didn’t have systems, and things got dropped. And they weren’t necessarily bad at the strategy, but they were bad at the structure, and that’s why so many people have terrible experiences with other agencies, and why I am seriously on a mission to change that around. And it’s why my business has grown as fast as it has, because of the referrals, because working with our team … and I’m not even trying to like, pitch it right now … working with our team is like a whole different experience with the level of communication, and it’s because of our systems. And I can’t say all of this without shouting out my mentor, Alex Charfen, because he has helped me so much in this way of like, how I look at systems, that literally, in the last 10 months, he’s changed my entire mindset to the point where, when a problem comes to me in the business, or when we reach a new level and a new uplevel, and I have to change something … I think differently than I did 10 months ago, because of his mentoring. And I’ve worked with him extensively for 10 months, and it’s just changed my entire perspective on how I look at team growth and business. And it is THE reason why I have been able to grow my business this fast (we just had a $2 million run rate) and also pull myself out of the day-to-day. So I’m happier than I’ve ever been. So, in this episode I’m going to give you guys the inside look at how our ads managers are trained. So, first of all, like I get asked all the time, “Where do you find your ads managers? How do you train them?” I initially made the mistake of finding my ads managers first in just like, Facebook groups and places where entrepreneurs were hanging out. So, that was a mistake, because then I found people who wanted to like, on the side, have their own business. And one of my biggest fears initially was like, “Oh my gosh, I’m going to teach you all my strategies, and then you’re going to go, and you’re going to start your own agency.” Because of my systems and the transparency in my business [and] with my team, I don’t even worry about that anymore, I don’t even think about it. It’s crazy. So, now we find most of our ads teams on sites like Indeed, We Work Remotely… places where we can post job postings looking for employees who have specific experience doing this. So, they have to have at least two years of working in marketing, in an agency. We’ve brought a lot of people in who have worked in previous agencies, who have some sort of digital marketing experience. So that was one of my mistakes is, I thought I had to train people from the ground up when I was growing my team and that I couldn’t like, afford somebody with experience. Hiring the people with the experience that I want is way easier, to bring somebody in like that and then train them on our processes and our ways, than trying to train them from scratch. So, we bring people in with at least two years of experience. We have the job super clearly defined, so that everybody knows what their responsibilities are. And we’re very upfront. We have, first of all, like before we even get to the training, we have an extensive interview process. You do a first interview with my Operations Manager. Then you take a test that takes about two hours, and it shows me how you think. So, it’s asking these people like, “Here’s a funnel, here’s the stats. What would you do differently?” so I can see how they think. It’s not a question and answer … so I review that. If they’re approved at that, then they have an interview with me and my managers. And then we’ll pass them, if they get that far. So, it’s an extensive interview process, which weeds like, 75% out, of the people from the test and the first interview, so they’re not even talking to me next. If they come onto the team, then they go through our 90-day training program. And I have it pulled up in front of me, so I can walk [you guys through it]. And the key here is like, everything is documented, everything is clear expectations. They see this training program when they come into the company, so they know what their expectations are to come into the company. So, in the first 30 days, they’re considered a trainee. During these 30 days, they go through… Week one is basically heavy training. I have an entire course basically, that I will never give to the public! Don’t even ask me, because I refuse to support that becoming an ads manager and agency owner is the new biz opportunity… so I will never give it. Like, I will never train people how to start their own agency, because that results in people with lack of experience trying to start an agency and screwing clients. So I will not be a part of that. But … sorry for that side rant, but it drives me crazy … But I have a course that basically, I took everything… and we’ve added to it, we’ve overhauled that course like, four times… of everything that people need to know. We get feedback from every trainee that goes through it, “What’s missing?” But it teaches everything from how we load ads, how we label ads, how we do targeting, how we do reporting, how we do client communication, how we do strategy calls, how we look at funnels, how we do tracking, how we do third party tracking, how we place pixels… Like, everything they need to know, there’s videos on it. And most probably know some of this, but they still need to go through and see our processes, because it’s very different than some other agencies. We’re very “big picture” in our agency, so we’re not just looking at ads manager and running simple campaigns, but we have to track all the way through the funnel. So that, plus the factor that it’s digital marketing, makes it a different ballgame for some people, and so we train it. During those days … it takes about 3-4 days to go through those videos … they have a 27-page workbook where they’re answering questions on every video, so that I can make sure they’re retaining it. And then they have a daily call for the first 30 days with my manager, whoever they’re reporting to, because they no longer report to me. And they go through the workbook. And then from the workbooks … so they literally look at the questions, and they’re like, “No, this is wrong. Go back and do this or this,” you know, “You got this wrong.” And they go through it. And then at the same time, after they go through the training, then they start shadowing and going into the sandbox. And the sandbox is where I have a play ad account that they go in[to], and they have to do all these different things. They have to create campaigns, they have to do everything they would do in their role: create a campaign planner, place test pixels on clickfunnels and leadpages, check data and tell me what the data says, listen to a past client strategy call recordings and tell me what the notes are … like, everything that they would do in their role, I have them practicing in what we call “the sandbox.” And then again, they review all their results and everything they have done with their manager on their daily training call for the first 30 days. This takes like, the first week. Then, … and we just actually increased it so that … or decreased it. It used to take the first two weeks, and we had a lot more sandbox things that we were doing. But we made it so it’s one week, and then we put them into the real … we put them into what we call, kind of like “apprentice,” earlier, because we felt like the real experience was needed faster than what we were doing. So, we’re always updating this. That’s also the key is like, I’m also always taking into consideration what is working and not working in the actual strategy. So then in week two they are what’s considered “assistant onboard,” which is where they do a ton of shadowing with my lead ads managers. They’re literally going on zoom, watching what they’re doing, taking notes, and then showing those notes to their manager. That’s the key here, too – everything is documented, so that everybody is accountable for what they have to turn in, so that we know ,as the people they’re reporting to, that they retain the information and where the gaps are. Then every single day, they also get assigned five of our clients … like, they’re not actually managing them, but they’re in the background doing mock daily tracking. So what that means is, they have their own spreadsheet. All my ads managers fill out daily tracking anyways for their clients, so these guys are like, doing their own version of daily tracking, so that we can compare it to the actual daily tracking and see how they did. So they’re starting to do that, starting to familiarize themselves with these accounts. They’re not necessarily going to take them over, but we are like, pretending: If you were managing this account, what would you change in here? What audiences would you add? Where would you add budget? What would you turn off? Because we need to see that they’re getting that, and they’re retaining that from the training. They also go on zoom, take notes of the strategy session, and then we basically have 10 questions for them. That’s like, the core things that they need to understand: loading ads, campaign planners, strategy calls, all the things that were in the training. And we have them rate on a one-to-five every day for the next week, how competent they are in all of those things and how confident they feel. And we want them to get to all fives. And so if there’s a place that they’re like, “Oh, I’m a three here,” then we say, “Hey, go with Ashley on my team,” who’s a lead ads manager, “and shadow her, and help her with that campaign planner if you need more experience with the campaign planner.” Because the key here is like, there are so many factors and things here that go into the marketing, and each client account has different scenarios that we need. And then each person retains information differently, [each person] who comes into our team, that we need to make sure we can customize the training to (a) have real client experiences, because they’re always going to be changing, it’s hard to replicate them. And then (b) that we can customize where they need extra support and give them that extra support. So that’s all of week two. And then in week three they basically start to get … They’re like “assistant ads managers” at this point. They’re still trainees, but we basically have our lead ads managers give them grunt work tasks like, “go find 10 new audiences and duplicate it in this ad account,” or “load this campaign for me,” or “task this out.” And the lead ads manager is still managing the account, and they just go check that person’s work, and they kind of use them as an assistant. Because it (1) keeps my lead ads managers in more of a strategic role, because that’s where they should be is like, they’re really good at the strategy and they don’t need to do as much tactical stuff. So they use these trainees to do tactical stuff. So weeks two and four, they basically do that, and they are like assistants in the background. We don’t let them be client-facing yet, and they’re practicing. And then that allows us … so that this lead ads manager reports to their manager, they have the same manager normally, they’re on the same little mini-team. If they see any red flags like, “Hey, I’ve told this trainee to load the ad this way three times, and she’s still not doing it.” Honestly like, being totally transparent, this also allows us to weed people out who are not going to work out, because that’s essentially the goal for me as the boss is, I want to be able to weed those people out before they get to be client-facing. I need to be 110% confident in this person before I introduce them to clients and actually having client accounts. The goal is to be at that place by week four. So by the end of week four, they have to be rating fives, on the scale of one to five, on every single one of those questions that we ask them. They have to be doing everything perfect in the back end. They have to have picked up strategy, fully immersed in the team. And then we start giving them clients. They still have … in month two, they meet with my manager three times a week. And then in month three, two times a week. And the first 90 days is really their trial period. We try and weed everybody out in that first four weeks, and we do have, even with this, my expectations for my company are so high that we still have a high churn, where about … it’s been about 50% of ads managers that come in actually make it past week two, because we just have crazy high expectations, like crazy high. But that’s how I’ve grown my business, and so I have to basically like, invest in this person and get enough people through this training to be able to get my team to where I want it. And it takes a full month to fully immerse them. So, that is how we, in the background, train our team. And maybe I’ll do another podcast on other internal things we do, because we do so much. We have daily huddles, we have weekly strategy trainings for my existing ads managers. It doesn’t stop here, but this is the new ads manager training that essentially is like, a wall between the clients and them until I’m 150% confident in this person. And I think these systems and this structure is why I have been able to … I mean, not “I think,” I know … why I’ve been able to grow as fast as I can without massive stress on me, in training these people. And if I had one thing to take away from this, it’s the importance of communication and very clear expectations for these people. Because when somebody starts a job, they want to know exactly what’s expected of them. So, the first day, the ads manager sees … “After 30 days, to graduate from a trainee to an apprentice, you need to be able to do all of these things.” They see that on the first day. Then they see month two … here is, “After 60 days, to be able to graduate, you should be able to do all of these things.” Month three, same thing. And by the end of month three, what we transition them into is, they need to be able to be on client calls, client communication. That’s what usually takes the longest amount of time, depending on the person. But that’s where it is. So, hopefully you guys enjoyed this. I’d actually love to know in the comments, or tag me on social media, Insta-story, whatever, like, if you enjoyed this type of a podcast episode, because it’s a little bit different than my like, “marketing tactics.” But I want to know, was it fun to kind of hear behind-the-scenes of how I actually run my company, serve our clients? Because if you guys like it, I can do more stuff like this. So let me know, give me that feedback. And if you want one of the Hirsh ads managers and Hirsh team … so when you work with us, you get an ads manager, my manager (which we call Senior Digital Strategist), and me, plus our creative team on your account. So you’re getting like, a whole team of really high-level trained strategists who are running The Hirsh Process and getting you results. So, if you want something like that, go to HelpMyStrategy.com and book in a call with the Hirsh team.